Getting in just under the wire for the Simon Says Stamp Get In Shape Challenge. My take on this challenge was the 3-D or raised frame on the card. To create this A2 card, I used Canson watercolor paper for all elements because of the color, which is an off-white tone. I cut the inside panel to fit the card. 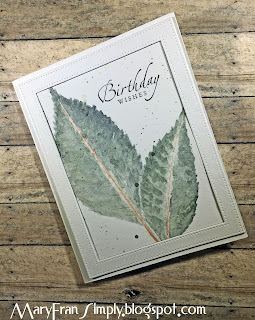 To create the leaves in this card, I used some leaves that are some of my favorites...the leaves from Wisconsin's Green Ash trees. They're being annihilated by the Emerald Ash Bore, so it's kind of a tribute to them. I gathered some leaves and put them between two pieces of watercolor paper and ran them through my big shot with the embossing folder sandwich. The result was just an impression that I could barely make out and I was really bummed, but then I thought I'd use the real leaves as a model and follow the impression with some watercolor paints and I really liked the results. I splattered it with some of the paint and then stamped the sentiment. Finally, I cut the frame four times and glued them together and adhered this to the panel. The supply list is below. As a side note, I used lots of different leaves and this was sooooo much fun. Your card is gorgeous! I love the classic design and the leaves turned out amazing. Great job! Thanks for joining us on the Simon Says Stamp Monday Challenge.